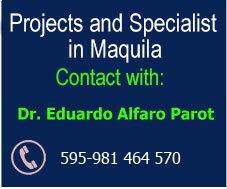 The maquila offers a unique opportunity for investors who want to take advantage of the preferential terms offered by Paraguay as well as those offered by the maquila system to greatly increase their competitiveness. The Maquiladora System is a system of production of goods and services, with the main purpose of industrial development, job creation and increase exports. Production or provision is made for and on behalf of a company based abroad, which is called Matriz (Headquarters). Under an international agreement all that is produced in the country is exported to the world. In Paraguay the Maquiladora System was created by Law No. 1064 of 1997 "De la Industria Maquiladora de Exportación" ("About the Maquiladora Export Industry") and is regulated by Decree - Law No. 9585 of year 2000, whose main objective is to promote the establishment and regulate operations of the maquiladoras companies in Paraguay. The Consejo Nacional de la Industria Maquiladora de Exportación (CNIME) (National Council of the Maquiladora Export Industry) is the driving member of the political maquiladoras in Paraguay. It is by the Ministry of Industry and Trade and composed of the Ministries of Finance, Foreign Affairs, the Central Bank of Paraguay and the Ministry of Planning. The Executive Secretary of CNIME, is responsible for ensuring the implementation of all the provisions of the Act and its regulations. This secretary is responsible to promote activities aimed at generating standards and best practices for developing the system operating conditions. Is also responsible for his promotion to achieve the incorporation of new companies to the list of maquiladoras already operating under the System. Among the services offered by the Executive Secretary of CNIME include: the permanent support in presentations of programs, management of procedures, providing information and links to various Ministries, with the private sector and financial institutions, among others. Also offer support to the administration and operation of the maquiladoras and export and import procedures. Since its inception, the system has proved to be a genuine tool to support the development of the national economy. With the maquila, not only products labeled "made in Paraguay" have traveled the world making our country more known, but also those services that paraguayan men and women are offering with high quality to the world through our call centers or call centers, and the design of computer software made ​​by 100% in Paraguay. Equally important to mention that the Maquiladoras operating under a tax system called TRIBUTO UNICO MAQUILA (UNIQUE TRIBUTE MAQUILA) of 1%.